It’s coming up on April Fool’s Day folks. And to celebrate the auspicious occasion, we delve into this 1986 slasher that is an under-the-radar near-classic. The plot couldn’t be more deceptively simple: a group of college coeds getting together to blow off some steam. That’s the premise of about 1000 horrors during the slasher boom. But April Fool’s Day gives us plenty of detours along the way. The disparate group of friends gathers on a dock. They’re about to be shepherded over to a remote island, the family home of the wonderfully (and WASP-y) named Muffy St. John. And the group is treated to a bunch of April Fool’s pranks along the way – you know the ones, your trick doorknobs and dribble cups. Suddenly, one of them vanishes. And this sets the ball rolling. 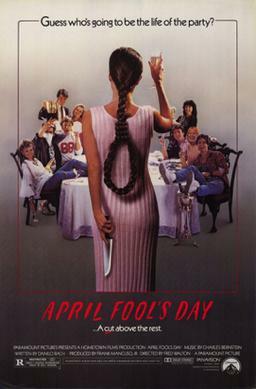 Too smart by half, April Fool’s Day easily stands apart from its date-themed horrors (apart from the grand daddy and acknowledged supreme effort that is John Carpenter’s Halloween, but that’s a given). It’s a wonderfully inviting and subtle work, directed by Fred Walton, the man who gave us When a Stranger Calls. The characters are well-written, well-rounded, and well-developed. The scene-setting (gorgeous BC) works in its favor. Horror fans will love seeing the ever-competent Amy Steel (Friday the 13th Part 2 and Part III). Join us on the Really Awful Movies Podcast. We do deep-dives into genre flicks of all stripes, predominantly horror.